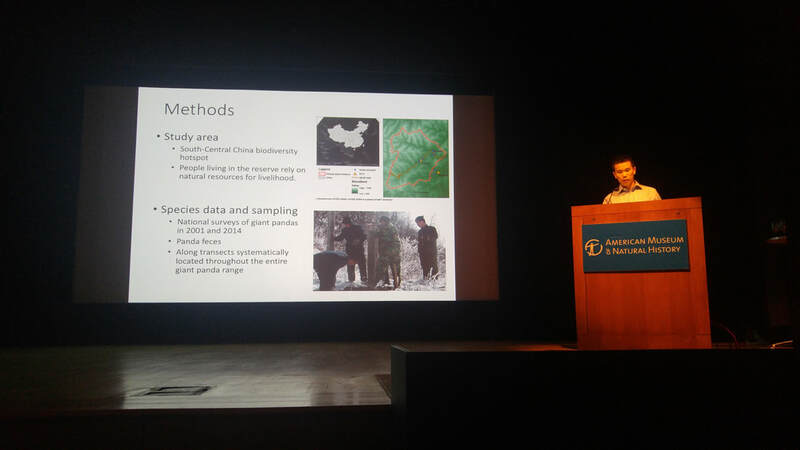 Christian Rivera and Yichao Zeng gave talks about their research at the Student Conference on Conservation Science (SCCS) in New York this week. Christian presented on his interdisciplinary project on turtle harvest in the Amazon and Yichao presented on his work on participatory mapping of medicinal herb collection in giant panda habitat in China. Great work! Vanessa Hull visited Boise State University this week. She gave a guest lecture in the Ecology, Evolution, and Behavior (EEB) Program weekly seminar and also spoke at an undergraduate class on Human Environment Systems. Vanessa enjoyed interacting with students in the Human Environment Systems program and the Conservation and Coexistence group. ​Vanessa Hull co-authored a new paper led by Jingjing Zhang in Biological Conservation on the spatial overlap between ecosystem services and giant panda habitat in China. The study showed a poor representation of ecosystem services in current protected areas for giant pandas and proposed revisions to the network that would better conserve both pandas and ecosystem services.